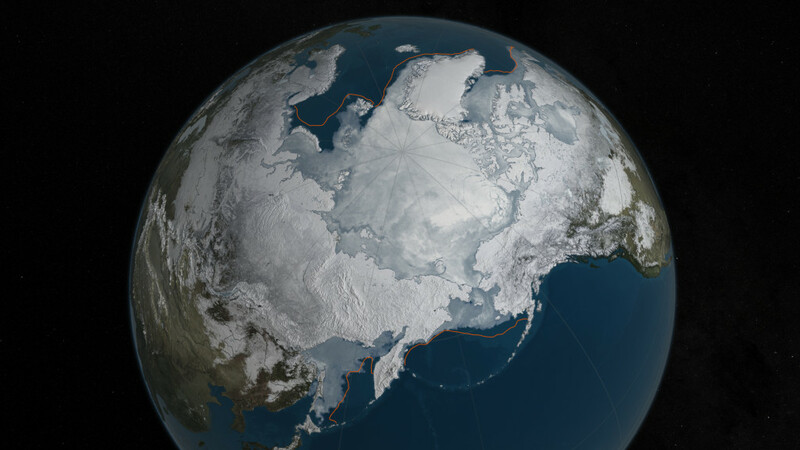 March 30, 2016 – Arctic sea ice was at a record low maximum extent for the second straight year, according to scientists at the National Snow and Ice Data Center (NSIDC) at the University of Colorado Boulder and NASA. Every year, the cap of frozen seawater floating on top of the Arctic Ocean and its neighboring seas melts during the spring and summer and grows back in the fall and winter months, reaching its maximum yearly extent between February and April. On March 24, Arctic sea ice extent peaked at 5.607 million square miles (14.52 million square kilometers), a new record low winter maximum extent in the satellite record that started in 1979. It is slightly smaller than the previous record low maximum extent of 5.612 million square miles (14.54 million square kilometers) that occurred last year. The 13 smallest maximum extents on the satellite record have happened in the last 13 years. 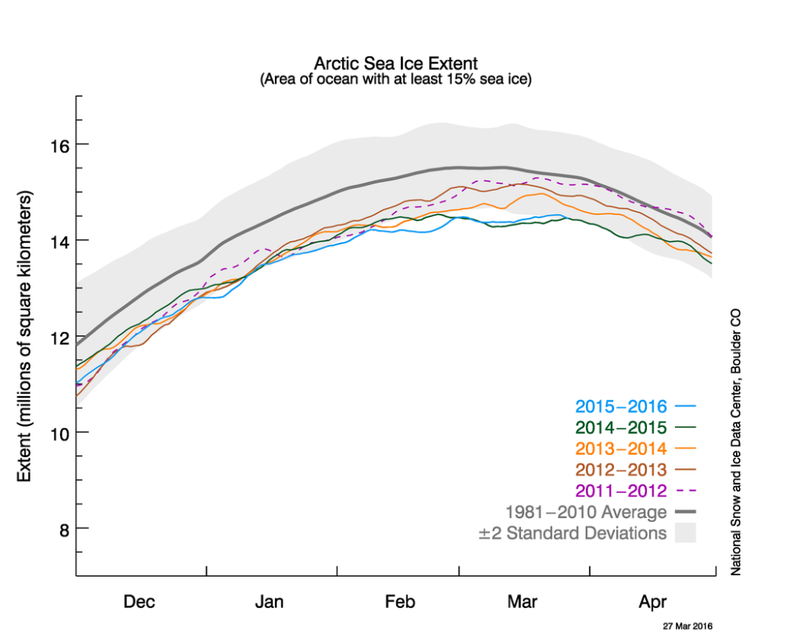 “I’ve never seen such a warm, crazy winter in the Arctic,” said NSIDC director Mark Serreze. “The heat was relentless.” Air temperatures over the Arctic Ocean for the months of December, January, and February were 2 to 6 degrees Celsius (4 to 11 degrees Fahrenheit) above average in nearly every region. According to NSIDC, sea ice extent was below average throughout the Arctic, except in the Labrador Sea, Baffin Bay, and Hudson Bay. It was especially low in the Barents Sea. Since 1979, that trend has led to a loss of 620,000 square miles of winter sea ice cover, an area more than twice the size of Texas. Ice extent increases through autumn and winter, and the maximum typically occurs in mid March. Sea ice then retreats through spring and summer and shrinks to its smallest or minimum extent typically by mid September. The September Arctic minimum began drawing attention in 2005 when it first shrank to a record low extent over the period of satellite observations. It broke the record again in 2007, and then again in 2012. The March Arctic maximum has typically received less attention. That changed last year when the maximum extent was the lowest in the satellite record. “The Arctic is in crisis. Year by year, it’s slipping into a new state, and it’s hard to see how that won’t have an effect on weather throughout the Northern Hemisphere,” said Ted Scambos, NSIDC lead scientist. NSIDC will release a full analysis of the winter season in early April, once monthly data are available for March.